Name of Off ice where to be applied: Headmaster, Dakshin Barpeta Vidyamandir High School. Name of Off ice where to be applied: Headmaster. Juroram Pathak Girls’ High School, Barpeta. 3. Name of School: Chhayaram Girls’ Institute, Barpeta. 5. Name of School: Patbausi High School, Patbausi, Barpeta. 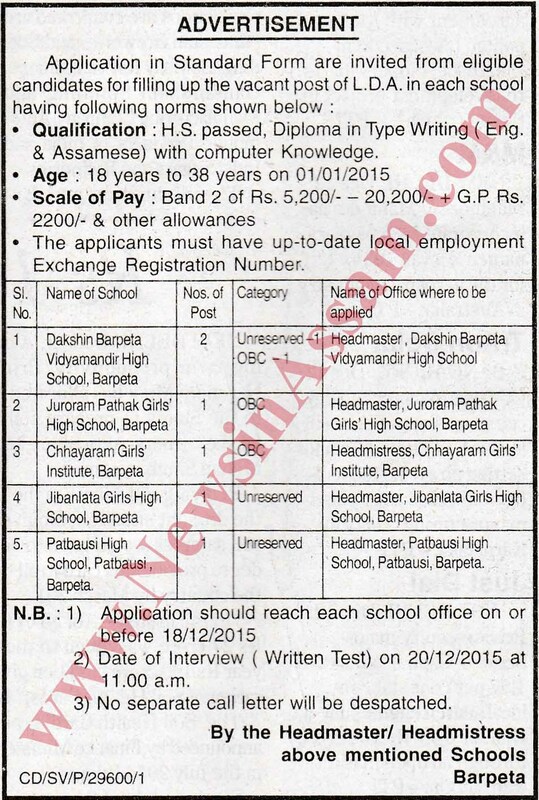 Name of Off ice where to be applied: Headmaster, Patbausi High School, Patbausi, Barpeta. Qualification : H.S. passed, Diploma in Type Writing ( Eng. & Assamese) with computer Knowledge. Date of Interview ( Written Test): 20/12/2015 at 11.00 a.m.
How to apply: All the intending candidates are requested to submit their applications along with photocopy of supporting documents and Employment Exchange Registration Card. Application will be received only at the respective high schools where posts are lying vacant on or before 18th December 2015.